Nintendo has been awarded almost a half-million dollars in a lawsuit against an Australian online retailer who which selling the R4 mod chip. RSJ IT Solutions and two "affiliated respondents," Patrick Li and James Li, were ordered by the Australian courts to pay $520,000 AU ($468,000 U.S.) for selling the R4 mod chip through its Gadgetgear.com.au website. The company has been ordered to halt all sales of the device in Australia and must also submit to the court a list that identifies all of its R4 chip suppliers. 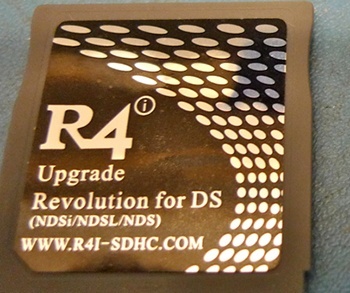 The R4 chip lets users bypass the copy protection measures built into the Nintendo DS, letting them play illegally downloaded games. While some websites sell R4 chips preloaded with software, ITNews.com.au says Gadgetgear, which appears to be more of a general accessories distributor rather than a mod-focused site, was selling just the chip itself, which could have been a factor in the relatively lenient punishment. This is the second high-profile court victory for Nintendo in Australia this month; earlier in February, James Burt of Queensland agreed to pay the company $1.5 million for uploading Super Mario Bros. Wii to the internet a week before it was released.